Johnson said she thinks students have lost their voice at Bradley. She believes students’ voices have become that of the administration, and she is running on the platform of unity and integration. She said she wants all student groups to do more together, and, if elected, she would plan events that would include everyone. 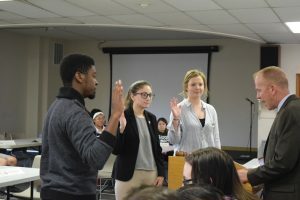 Although not previously a member of Student Senate, Johnson said she has gained leadership and organization skills from other organizations, such as her experience as co-president of Tunnel of Oppression. She has gained some relationships with administration from her involvement as well. This is Ticaric’s third time running for president, and she has served the past two terms as president. Ticaric said she wants to listen to students and see what they want changed before creating a plan of her own. She has established good relationships with administration, and she wants to figure out ways to get administrators to agree to changes as quickly as possible. She said she isn’t afraid to ask them for the “big ticket items.” She wants to train younger members and let them shadow her so they can become leaders. Despite being a freshman, Swiatkowski said he is capable of leading the student body. He has served on Senate for one year, and he said the experience has shown him what he would like to see changed. The number one change he said he would bring would be communication. He said he thinks the reason there aren’t enough Senators is because too many people don’t understand what Senate is, and more communication would reverse that problem. He said to increase communication he would have Senators serve more efficient constituency hours and would host more campus events. As a freshman, he said that if elected, he would be on campus for three years to continue his work. As this year’s internal affairs committee chairman, Malinowski said he’s gotten to see how things work behind the scenes at Senate. Malinowski heads the Jumpstart Campus campaign. The campaign is based on reforming senate, unifying campus and establishing identity and pride for Bradley. He has experience on hall council, and said he organized an event that increased attendance by 400 percent. As a fraternity member and resident of the dorms, he said he is connected to campus and is eager to freshen perspectives on Senate. As a freshman never having been on Senate, Anklan said she brings leadership experience from hall council and high school to the table. She also won an outstanding freshman award this year for her involvement and academics. 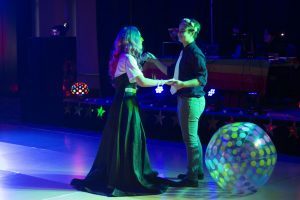 As an out-of-state student, she said she is always at Bradley on the weekends and is very connected to campus life. Anklan shares the goals of the Jumpstart Campus campaign, and hopes to bring a fresh perspective to Senate and represent the underclassmen. Peters has been very involved in campus life at Bradley, serving as the Activities Council Special Events Reserve Fund co-coordinator and the director of recruitment on Panhellenic Council. Aside from those activities, she was academic affairs chairwoman on Senate this year, and she said she has seen the vice president work within Senate. She said, as vice president, she would make sure all senators were well informed about parliamentary procedure. She also said she would be the “backbone” of Senate, and help the president whenever needed. Supporting committee chairs is also important to her. She said, if elected, she will create goals with the rest of the executive board, including long-term goals that would benefit students. Mayer said he is running for vice president because he wants to take on more responsibility in Senate. He serves as a senator for the St. James Apartment Complex. Mayer said the constituency hours should be more effective, which is in line with his ticket. In addition to constituency hours, Mayer also said he would like to open lines of communication between Senate and the campus community, which is also part of his ticket’s platform. Having served as a senator this year, Esken said she is eager to become more involved in senate and campus life. She believes the goals of the Jumpstart Campus campaign will be the first steps to improving campus. As an off-campus resident from Peoria, she said she is able to represent a large part of campus that is often overlooked. Esken said she may better see how communication needs to increase on campus, because she doesn’t live in the residence halls. Esken said she hopes to work with the Scout closely to publicize events, in addition to putting fliers around campus. Koors said she wants to be secretary because she has served on Senate as the diversity affairs chairwoman and wants to take on more responsibility. She said her year on Senate and her experience on the Panhellenic Council as president and activities director have prepared her for holding the secretary position, should she win. She said increasing communication inside Senate is one of her top priorities. She also said she would like to post Senate’s minutes in places students could see them, such as residence halls and the Michel Student Center. Campbell said he has realistic ideas for the position of treasurer within Senate. He said instead of pushing for tuition cuts, he would spend his time working toward more easily achievable goals. He wants Senate to provide a forum to let students know about scholarship opportunities and change some disproportionate funding within Student Activity Budget Review Committee. Although he has only served one semester on Senate, he has experience in leadership roles as the founder of a not-for-profit that motivates at risk children. Lombard said he is running for treasurer because he wants to work with Senate finances, especially during the recession the country is experiencing. He is serving as an IFC Senator, and has financial experience. He has worked as a teller in a bank and with a construction company’s finances. He said if elected, his financial experience and working relationships with other senators would be his strongest traits. Integrating campus would be another goal of his, he said.